San Luis Río Colorado is a city and also the name of its surrounding municipality. In the 2015 census, the city had a population of 192,739. The city is the fourth-largest community in the state, and the municipality is also the fourth-largest in terms of population. 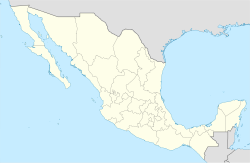 Lying in the northwestern corner of the state of Sonora, the city marks the state border with Baja California. It also stands on the international border with the United States, adjacent to San Luis, Arizona. It is located about 75 km from Mexicali. 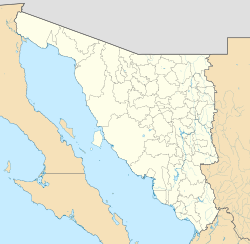 The municipality covers an area of 8,412.75 km² (3,248.2 sq mi) in the Sonoran Desert. Awarded city status in July 1958, San Luis Rio Colorado serves as the administrative center for the surrounding municipality of the same name. The city is located on a mesa, characterized by a flat and sandy terrain. On Easter Sunday 2010, a 7.2 magnitude earthquake struck the region. The Sears department store and 5 schools were destroyed, affecting approximately 30,000 people in the region. San Luis Rio Colorado was once an important inland port for steamers traveling the Colorado from the Gulf of California. Since the early 1900s the Colorado has been completely or nearly completely drained for irrigation. The once-formidable Colorado is usually dry or a small stream. San Luis Rio Colorado is home to four regional medium-wave radio broadcast stations, among them 1350 XELBL-AM, all of which are popular long-distance reception targets for medium wave DX radio enthusiasts. Josse, a Mexican Latin beat singer recorded a song call "San Luis Rio Colorado" at memorial for the river. Fiestas del Desierto celebrates the culture, biodiversity, cuisine and sports of the Sonoran Desert Region. Dates for 2012 are 9–11 November. San Luis Rio Colorado has an intra-city economic exchange booth in the Annual Riverside County Fair and National Date Festival in Indio, California, USA. San Luis Río Colorado has a desert climate (Köppen climate classification BWh), with extremely hot summers and mild winters; it is one of the hottest and driest cities in Mexico. The record high temperature is 52.0 °C (125.6 °F), recorded on 25 June 1951. The record low temperature is −6.5 °C (20.3 °F), recorded on 2 January 1950. Maquila factories in San Luis Río Colorado include TSE Brakes, Daewoo Electronics, Bose, SANA International, OPTECH, and Gaming Partners International. San Luis Río Colorado Airport is the general aviation airport serving this city. The nearest International airport to San Luis Rio Colorado is General Rodolfo Sánchez Taboada International Airport near Mexicali. San Luis Rio Colorado has highway connections to other parts of Mexico and the United States. Several intercity bus companies (including TUFESA) stop at the San Luis Río Colorado bus station. Alfredo Aceves, professional baseball player for the New York Yankees. Efrain Escudero, MMA fighter for the UFC. Jorge Páez, former WBO and IBF Champion. Azriel Páez, undefeated Welterweight prospect and the son of former Champion Jorge Páez. Carlos Palomino, former WBC Welterweight Champion and member of the International Boxing Hall of Fame. Rogelio Medina, boxing Middleweight contender. Ignacio Mondaca Romero, writer, author of Relatos de Ocio among other books. Jesús Sánchez García, professional footballer for Club Deportivo Guadalajara. ^ a b "Servicio Meteorológico Nacional: Valores normales de 1971–2000 para San Luis Río Colorado, Sonora" (in Spanish). Servicio Meteológico Nacional. Archived from the original on 3 March 2016. Retrieved 24 November 2016. ^ "DATOS CONTENIDOS EN LA BASE DE DATOS CLIMATOLOGICA". Servicio Meteológico Nacional. Archived from the original on 3 May 2012. Retrieved 22 October 2011. ^ "Greater Yuma - Maquila Companies". www.greateryuma.org. Archived from the original on 2 February 2016. Retrieved 24 April 2018. ^ "Jesús Sánchez Player Profile - ESPN FC". soccernet.espn.go.com. Retrieved 24 April 2018.